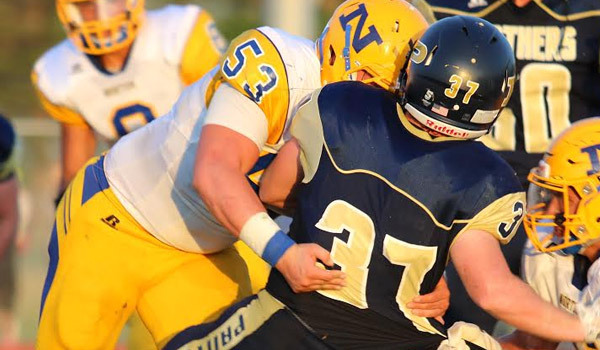 Norton’s 6-foot-1, 225-pound junior Jacob Green lined up at multiple spots along the defensive line in Friday’s road contest versus rival Phillipsburg. Green wreaked havoc with three tackles for loss in the first half. The Panthers collected five total yards after the first quarter and had minus-2 total yards with 3 minutes, 57 seconds left in the first half. Green finished with 14 tackles and five for loss, both career highs, in a 7-6 Bluejay victory. His lone obstacle was cramps that limited him for part of the contest. After finishing third in the Class 3-2-1A state wrestling meet at 220-pounds a freshman, Green was a favorite for a state championship last season before he injured his knee before regionals. Green lists himself as 100 percent now but isn’t fully conditioned yet. In 20 career contests, Green now has 135 total tackles and 42 tackles for loss. Last fall, he finished with a team-high 86 stops and 22 TFLs, most among Kansas sophomores. He has 20 tackles with nine TFLs in two games this fall. Norton has traditionally had strong defenses in Lucas Melvin’s ten seasons as head coach. In 2014, the Bluejays went 10-1 and allowed 11.4 points per game, the most wins and best scoring defense in the Melvin era. Norton stands just outside of the top-5 in the 3A rankings and has permitted 18 points in two victories, tied for 12th best in the classification. Ellis and Phillipsburg went a combined 6 of 30 passing for 48 yards versus Norton. The Bluejays lost senior running back/defensive back/returner Gavin Lively to a knee injury last Friday, but remain a 3A contender because of Green, Dole, Ruder and a solid supporting cast. The Bluejays allowed 12 points versus Ellis in the season opener when the game was well out of reach. Green played linebacker in the younger ranks; moving to the defensive line in high school. He delivered 29 tackles, 11 for loss, as a freshman on a 5-5 team. Green has several advanced moves, including a swim technique that he uses often. Veteran assistant line coach Tony Fiscus decided to have Green line up at different spots, a rare move. Melvin called the Bluejays’ defensive effort versus Phillipsburg “unbelievable.” The Panthers often ran away from Green. “He has given me the choice to go wherever I wanted to, so I am not limited in an area, and that takes a lot of acceptance from my other linemen to move whenever I want to, so I give a really big thanks to them,” Green said. Senior defensive back Tevin Brown and Dole are returning defensive starters. Seniors James Berry and Cameron Heikes and junior Trenton Wright are among those who have stepped up. Phillipsburg tallied its fewest points since a 36-0 loss to Beloit in Week 9 of the 2009 season. The Panthers’ lone score, a 30-yard run by freshman Trey Sides, came when Green was on the sideline.